The cult classic Zombieland, which came out in 2009, may be getting a sequel. Writers Rhett Reese and Paul Wernick--who wrote the original--told Vulture that a sequel with the original cast might be in theatres by October 2019 to celebrate the original's 10-year anniversary. "We're going on the tenth anniversary of Zombieland,” Wernick said. 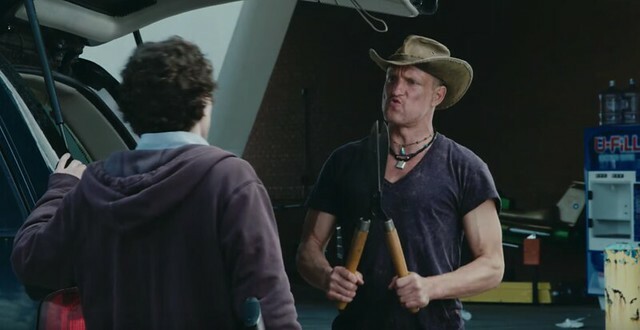 "Zombieland came out October of 2009. We don't know what you get someone for their tenth anniversary, but it may be a Zombieland 2...with the original cast, by the way." Zombieland starred Jesse Eisenberg, Emma Stone, Abigail Breslin, and Woody Harrelson, as well as Bill Murray in a wonderfully silly and morbid cameo. The movie, which was directed by Ruben Fleischer, made $102.4 million against a $23.6 million budget. It was generally well-liked by critics for its silly story and zombie-killing mayhem. Wernick added that they will hopefully be able to share more news soon about the sequel, which will reportedly start shooting in early 2019. "We are sitting on information that we can't entirely share at this moment," he said. "But we can just say we think fans of Zombieland who have been hoping for a Zombieland 2, that we will grant their wish very, very soon." Nice! I totally have one of those tarp hats from Real Deal Brazil. I still wear it all the time. They are great because you basically can't damage them. Get it wet or dirty or whatever, it doesn't matter. Just hose it off and it's perfect again. One of my favorite zombie movies, mostly because of Emma and Woody. I like the 1st one alot. Doing sequels a decade or so later rarely is a recipe for success. They may have missed their window . Agreed. Like most people, I really enjoyed the first one but it was probably best left alone. Here's hoping for the best though. This brings a smile to my face!